A quality, brand value saw chain delivered direct to your door. 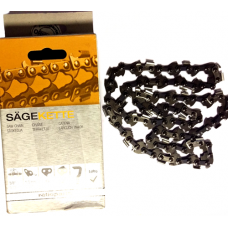 Before you purchase a replacement chain please ensure you have identified the correct size for your machine. Saw chain is measured by the width of the chain and the number of drive links. Identify your chain, check your manual or look on the chain itself. The width is normally stamped in and you count the individual drive links. 20" Chainsaw Saw Chain 78 links 0.325" 1.5mm 0.0058"
20" Chainsaw Saw Chain 76 links 0.325" 1.5mm 0.0058"
18" Chainsaw Saw Chain 72 links 0.325" 1.5mm 0.0058"
16" Chainsaw Saw Chain 68 links 0.325" 1.5mm 0.0058"
16" Chainsaw Saw Chain 66 links 0.325" 1.5mm 0.0058"
15" Chainsaw Saw Chain 64 links 0.325" 1.5mm 0.0058"
14" Chainsaw Saw Chain 61 links 0.325" 1.5mm 0.0058"
13" Chainsaw Saw Chain 56 links 0.325" 1.5mm 0.0058"
11" Chainsaw Saw Chain 52 links 0.325" 1.5mm 0.0058"
18" 45cm Chainsaw Saw Chain 63 links 3/8" 1.3mm 0.50"
18" Chainsaw Saw Chain 62 links 3/8" 1.3mm 0.50"
18" Chainsaw Saw Chain 61 links 3/8" 1.3mm 0.50"
18" Chainsaw Saw Chain 60 links 3/8" 1.3mm 0.50"